Years ago I had a recipe for HOMEMADE TOOTSIE ROLLS. Now I can't find it and I have grand kids big enough to help. Does any one out there have a recipe? As I remember it there was only cocoa, powdered sugar, and butter? Karo syrup?..... that is where I forget. I've had a little look around and found a few recipes for you. See if any of them ring a bell. Now, you be sure to come back and tell us which one you used and how it turned out. If you've got pictures - even better! This is a microwave recipe for Tootsie Roll type candy from About.com. Place chocolate and butter in a glass measuring cup (4-cup). Microwave, uncovered, at high power for 3O seconds, stir and heat for another 30 seconds, or until chocolate is melted. Stir in corn syrup and vanilla and return to microwave, heating on high power for 1 minute. Remove from microwave and mix in 1 cup powdered sugar and the powdered milk and stir thoroughly. Sprinkle the remaining powdered sugar on a large piece of waxed paper. Turn mixture onto waxed paper and knead candy until stiff, adding as much powdered sugar as necessary to form a stiff but pliable dough. Divide the candy into four sections. Roll each section into strips the width of a pencil. Cut each strip into bite-sized pieces and wrap in waxed paper. 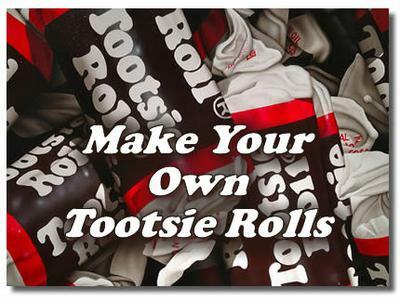 You may need to refrigerate the "Tootsie Roll" candy to get it to set completely. Makes about 40 pieces. This recipe is a "no-cook" recipe for Tootsie Rolls. Combine the dry ingredients - cocoa, dry milk, and powdered sugar. In a large bowel, mix together the butter, syrup, and vanilla. Add the dry ingredients and mix thoroughly. The mixture becomes very thick. Roll into ropes and cut into tootsie roll shapes. Wrap in waxed paper. This recipe for Tootsie Rolls is a bit more involved than the other two, but you may enjoy it more precisely because of that! The work is part of the charm and fun. Butter a non-stick baking tray and set aside. In a heavy saucepan, stir together all of the ingredients over medium heat until thoroughly combined. Insert a candy thermometer and bring mixture to the firm ball stage (250 degrees F.). Pour mixture onto prepared baking tray and allow to cool slightly (about 7-10 minutes). Butter your hands and grab the edges of the mixture turning it onto itself. Continue to do this until the candy is cool enough to pick up in your hands. Now for the fun part! Pull and twist the candy mixture for about 10 minutes. It will begin to lighten in color. Set candy aside for an hour or so and then twist and pull again for about 5 minutes. Again, it will lighten. Separate into sections and roll into ropes about the width of your fingers. Cut into one inch pieces and wrap in waxed paper squares twisting the ends. We use the method in option #3 except that we use no vanilla and thus a whole teaspoon of orange extract.People can't believe how On The Nose these Impostors are! They sell like crazy at bake sales and are always a welcome treat to share at the office or in gift baskets. Most chefs would use unsalted butter and add their desired amount and choice of salt, because the amount of salt in salted butter ranges greatly. Much more than 1/8 tsp in many examples. You could use salted butter, but to repeat/replicate your desired outcome/finished product, you would need to use the same brand of salted butter every time so you could find the amount of added salt that tastes/works best with the brand of salted butter that you use/choose. Clone Tootsie Roll recipes might still be very good without using orange flavor of some type, but commercial/store bought Tootsie Rolls definitely have some orange flavoring of some type. You can try any clone Tootsie Roll recipe you want but if it doesn't have any orange flavoring in it then you will not come as close to the flavor of commercial Tootsie Rolls as you could have. No orange flavoring="Oopsie Rolls"
I suppose they could still be better/more enjoyable without any orange flavoring since you are making them with quality ingredients and no preservatives, but it would be like trying to clone your favorite store bought Sweetened Lemon Ice Tea without using lemon flavor of some type. would it taste any bit like REAL tootsie rolls? how about with cocoa powder instead of melted chocolate? somebody help! Maybe you can substitute corn syrup with agave syrup. I haven't tried it, but I do substitute agave syrup in baking recipes instead of sugar. Much healthier for you. Good luck! Do you guys know any recipes w/out corn syrup of any kind? At a low heat, melt a large amount of marshmallows with the butter in a sauce pan. Spoon onto parchment paper and refrigerate 12 hours. Join in and write your own page! It's easy to do. How? Simply click here to return to Homemade Chocolate Candy Recipes. Chocolate Christmas Candy is a combination of my favorite time of the year and my favorite delectable sweet. What more could you ask for? Finding chocolate fudge on eBay is a sweet surprise for those who love to sink their teeth into a tasty auction. Don't worry -- your e-mail address is totally secure. I promise to use it only to send you Charmingly Chocolate. Interested in building your own site for business or pleasure? Learn from the best like I did, choose Solo Build It.